‘How to clean an oven’ is a common question that we are very often asked here at Ovenclean. So, we’ve put together some handy tips on cleaning an oven in 10 steps, based on how our skilled specialists transform dirty ovens to sparkling clean. First of all, you need to ensure that you and your kitchen are prepared. Put on some rubber gloves, wear protective clothing that covers your arms, and follow any other safety precautions that are mentioned on the label of the oven cleaning product you’re using.We also recommend cleaning your oven at a time when the kitchen is less busy – off-the-shelf domestic oven cleaners often contain fumes that pose a risk children and your pets. Unlike off-the-shelf oven cleaning products, Ovenclean uses an exclusive, innovative and no added caustic system, meaning that your kitchen will be completely safe, hygienic and free from any fumes that may harm your family. Our specialists aim to complete work with minimal disturbance to family and home and all kitchen appliances are completely safe immediately after use. 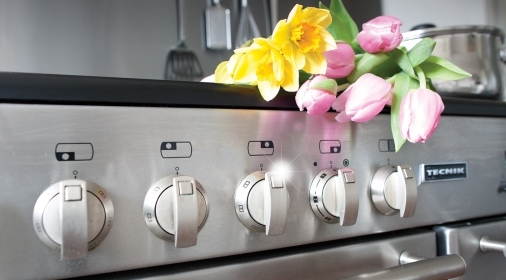 Switch off all your oven’s electricity, including turning off the pilot light, and ensure that the oven is cold. Put plenty of protection on the floor around the oven and cover any adjoining surfaces with newspaper before cleaning your oven. Remove the oven racks and leave them to soak in hot water and washing up liquid. 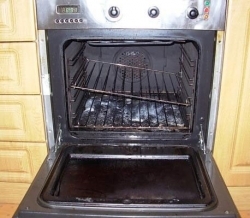 An Ovenclean specialist will also remove the door on your oven and clean this separately, but this can be difficult to do yourself so you may feel more comfortable leaving this on. You will also need to remove the fan filter at the back of your oven and clean this. Ovenclean specialists carry a range of extraction filters, lamps and universal seals in case any of these components need replacing. If you require additional or specialist spares, let your local specialist know in advance and Ovenclean can order the part for you, or recommend a reputable supplier. Follow the instructions on the label of your oven cleaning product, and double check that you have taken all necessary safety precautions. Apply the solution to the oven and leave the product to work its magic on your oven. Whilst your waiting for the solution to work, clean the oven racks. You can clean these in the sink by scrubbing them with some soapy water and dishwasher liquid, leaving them to soak. Now back to the oven. After you have waited for the product to take effect (according to the Manufacturer guidelines), take a scourer and scrub at the inside of your oven and the door. If there is baked on food that is particularly difficult to remove, use a glass scraper to scrape it off. Grease and oil will easily wipe off with hot water and oven cleaning solution. When the oven racks are clean and have been dried, carefully place them back in the oven. Give the whole oven a final wipe down to remove any excess grease, cleaning solution and residue. 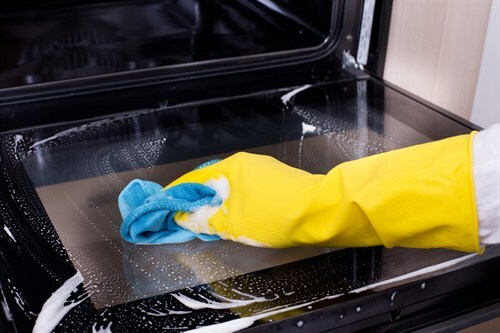 It’s no secret that cleaning an oven with domestic oven cleaning equipment can be an arduous chore. Fiddling with the components, battling with baked-on food and scrubbing for what feels like hours isn’t much fun, regardless of how much time you may have on your hands. 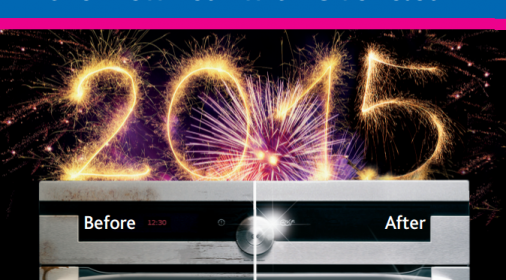 So, if you want to save yourself time and make your oven sparkle, why not request a free quote from Ovenclean? Click here to see some Real life Before and After Images of our what our specialists can do. Call Ovenclean on 0800 840 7127 or request your free estimate here.